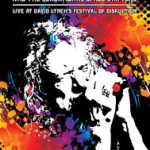 Share the post "DVD review: ROBERT PLANT and the SENSATIONAL SHAPE SHIFTERS – Live at David Lynch’s Festival of Disruption"
Recent live DVD “Live at David Lynch’s Festival of Disruption” captures the performance from Robert Plant and the Sensational Shape Shifters, and finds them in fine form. Recorded in L.A in October 2016 at David Lynch’s Festival of Distortion, and with a set that includes “Black Dog”, “Babe I’m Gonna Leave You” and a medley of “Hoochie Coochie Man”, “Whole Lotta Love”, “Mona” and “Going to California”, alongside more recent material from current solo band, fans of Led Zeppelin will probably be cheered by this release, especially as it now looks like the band probably won’t perform together in the future. The Sensational Shape Shifters sound blends rock, folk and Americana and perfectly fits Plant’s vocals, and are the perfect backing band for the man who set the path for many singers that followed in his wake over the years. “Live at David Lynch’s Festival of Disruption” finds Robert Plant and his band sounding great and clearly enjoying what they are doing. If you get a chance to see them live, it looks like you are in for a great time. This entry was posted in All Posts, DVD REVIEWS and tagged Americana, classic rock, David Lynch, DVD, Eagle Vision, Led Zeppelin, Live at David Lynch’s Festival of Disruption, review, Robert Plant and the Sensational Shape Shifters, rock, world music. Bookmark the permalink.